From now on through the next few weeks, I’m going to bombard you with the reviews that an esteemed panel of judges (well, esteemed except me) are writing for the companies that are participating in the CRM Idol 2011: The Open Season competition. This thing has burgeoned into something rather large – at least within the confines of the CRM industry – and is a chance for small companies who are attempting to penetrate the CRM, SCRM and related markets (despite the proclamations of its death) and are being given a stage to be declared after an easy-to-enter, hard-to-win CRM Idol 2011 – the best of a heavy vetted lot of small companies with a real future. Even those who don’t win deserve their day in the sun. So in addition to these reviews being published on the CRM Idol website, we would like to get them to you guys to read elsewhere too. And to comment on them. See what’s going to happen is that there will be semi-finalists chosen and your comments on the website, on our blogs, at the press sites that are covering the reviews (more on this later this week) will matter in the selection of those semi-finalists. What I’m going to do is to get these out to you as I get them. Roughly, 2-4 a day will be published and some days even more than that. Please spend time reading them, looking at these companies, give me your thinking on these companies in the comments section of this blog, PGreenblog, or the CRM Idol website or all three. Each review has been signed off by all the CRM Idol Primary Judges – currently for the Americas and in early September for EMEA. So these are all jointly done in effect. They represent a distillation of the understanding of the companies and their products from the principals who did the demos and briefing with us throughout last week and through the end of this week. This time 39 in all, due to a withdrawal of one company for inescapable reasons. What you’ll see here right now is four companies: Phaseware, Performance Solutions S.A., this morning and Soluciones S.A. and Jaguar TPM later this afternoon. I hope that you’ll not only learn something of these companies but respond with what you think. Phaseware was co-founded in 2005 by Randall Nelson (CEO) and Hoyt Mann (president) two industry veterans who first worked together at RamQuest Software. The company made its first sale in 2006 and achieved profitability in 2007. Phaseware dedicates itself to providing customer service solutions to SMB companies in the five million to twenty million dollar revenue range. Phaseware has just ten employees serving more than one hundred thirty five customers. Phaseware has no outside capital and plans to continue its organic growth focusing on a variety of industries including software, medical device hardware and outsources services. Phaseware goes to market in two modes on-premise and on-demand using the same code base a trait enabled by the Microsoft platform. The customer base is roughly evenly divided between premise based (55%) and cloud (45%) and the company enjoys high levels of customer retention, which it describes as being in the “upper 90 percent” range. One reason Phaseware can run so lean is that it relies on a Microsoft stack including .net for application development. The company leverages the Microsoft partnership for its foundation and focuses on customer service and feature development. The Phaseware product suite consists of five related products. 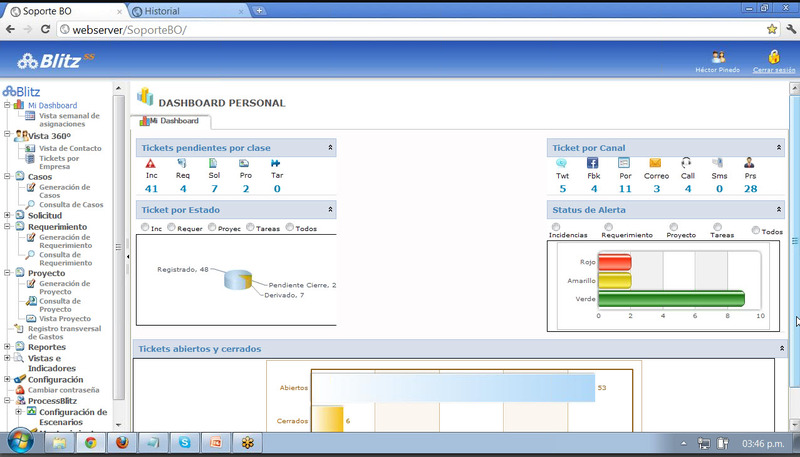 Self Service Center (customer web portal). This customer portal offers a clean and serviceable though somewhat dated user interface enabling customers to search for information in the vendor knowledgebase. Customers can generate a service ticket through the web interface to initiate a deeper service process. Knowledge Base. Phaseware uses Microsoft Silverlight for content management for documents FAQs and articles. The knowledgebase is accessible through the Self Service Center as well as the Tracker products. Integrated Chat. There are two chat channels available in the system including one for vendor to customer communication and another for supervisor to agent for training and monitoring purposes. Event Engine (business rules automation). Phaseware put a great deal of effort into the product to enable its customers to define business rules for processing customer requests. Ad hoc search boxes in the system enable customers and vendor agents to drill into customer, product and other parameters to identify issues and their resolutions. Tracker and Tracker on Demand (agent desktops). The company offers two agent desktops (Tracker) for remote and premise based agents. Through Tracker agents can define business processes using the rules engine and customize business processes. Users also have the ability to design and manipulate screen design to better reflect their work styles. The system comes with a full array of functionality designed to make the agent productive and provide a quality customer experience. Some functions and features include alerts, automatic case escalation, targeted email, customer forums, auto reminders to customers and automatic report distribution. Phaseware fits its niche well and prides itself on its customer care responding to its customers within a two hour window (using its own products). Its close alliance with Microsoft and dedication to the platform help ensure the Phaseware can continually bring its customers a steady stream of updates and enhancements. Looking ahead, Phaseware is well situated to continue improving its product line selling into a broad market for SMB customer care and customer service systems and growing organically. Performance Solutions S.A. creators of the customer service product suite Blitz, was founded in 2006 in Lima Peru by its current managing director, Marcia Garcia-Smith. They have 16 team members who include a number of employees and contractors who are working for Performance Solutions. As with most of the competitors in CRM Idol, only a small number of the team members are employees who function as part of a team consisting of those employees and contractors and the management of the company. In fact, the employees on the demo call went out of their way “we don’t work for Maria. We work with Maria,” something that Maria confirmed, which indicates a closely knit organization with a relaxed and somewhat (please note the use of somewhat here) non-hierarchical organizational culture. The company is bootstrapped, funded primarily by Ms. Garcia-Smith and one member of her family. There are no outside funds. They have about 20 customers that are distributed across multiple verticals including financial services, telco, airlines, and health services. Their market has been until very recently strictly focused in Latin America with customers primarily in Peru and also Colombia, Ecuador, Chile and Argentina, although the latter four countries has been more consulting customers than product/solutions directed customers. But in the last several months, they’ve had their first English speaking customer in the United States, which led them to accelerate their program to get to the U.S. market, which as we’ll see shortly has implications for their product that are quite important. To date their regional customers has been widely scattered among banks, retail stores/chains, insurance, hospitals, airlines and a government agency. What makes it a bit unusual is that they also have a strong “vertical” area in economic groups – Latin American based family-owned businesses that control a variety of interests. For example, one economic group using Blitz controls 120 companies of varying sizes. What remains a bit unclear, besides their interest in going to market in the United States, is their future go to market strategy because they have such general penetration in the Peruvian market in particular, though still a small customer base and because the customers in the other countries are primarily consulting customers. Their portfolio, called, all in all Blitz, consists of two products and what they call a “platform. It is geared to customer care centers, an increasingly crowded market and one that takes in general exceptional performance and a high level of differentiation to make any real progress in all in all. But the products are very focused around some particularly interesting capabilities so that there is a decent chance, with some caveats, that they can do well in this busy marketplace. Their business model, according to their own literature: “Blitz is a platform that has a complete set of tools to help Business SERVICE & SUPPORT their customer base, in a BOUTIQUE CONSULTING mode. (Their capitalization).” This is something we find confusing given their line of reasoning to us which was more supportive of a solutions based model more akin selling the products; provide professional services to implement them. Strategic consulting did not seem to be something that they were terribly interested in. We saw no evidence of sales force support in their offering, though a highly customizable offering can, we’re sure provide that with some work. Blitz is a customer service product suite that consists of three offerings: two products – a Self-Service portal; a Channel Manager and what they call a platform -CRM Service and Support Workflows. Their entire portfolio is built on a Microsoft SQL and .NET framework with an MVC architecture that allows them to port the products to DB2 and Oracle databases if need be. Their roadmap is geared in a few directions in 2012 and beyond with an increased use of webservices and cloud APIs, many already used in their Channel Manager product. These not only allow for better mobile offerings beyond their current Blackberry effort, but stronger integration with other CRM products like salesforce, SugarCRM and vTiger – three they specifically named. What they do have to their great credit is a highly and somewhat easily configurable platform and product set that allows deep customization, which, given the disparate kinds of customers they have is a definite and important quality of their portfolio. While they have three offerings, they are clearly focused on Channel Manager, the one product that the judges had a chance to see in depth in the course of the demonstration. Channel Manager functions as more than just an aggregator of social and traditional contact center channels. It allows the agents to not only record the interactions, and view them on screens that are clean and easy to read, but also to respond to the queries, questions and problems and ties the customer’s interactions to any service level agreements they have with the companies they are communicating, with. One great strength of Channel Manager is the ability handle social inputs such as Facebook and Twitter and more traditional channels such as email in a matter of fact way – as part of the agent’s life, rather than something that stands out as a “wow isn’t this cool” set of screens every time it pops up. It reflects a recognition (that we applaud) that social channels are just that – channels, no more, no less and they are used for more inputs from and insights into customers. We didn’t see evidence of any way to handle phone calls which might have been an oversight in the demo, so we’ll just leave it as a comment. They have a small analytics set with a simple, easy to access and use personal dashboard that provides some basic, though not much more than that, metrics for an agent or manager’s perusal. Here’s a screenshot to give you an idea of what this looks like. What still remains a little unclear is their scalability to the larger enterprises in the U.S. market which are considerably larger than the larger enterprises in LATAM. However, they do claim to have their enterprise product now and ready. The Blitz Channel Manager, the only product we’re qualified to speak of, is a well thought out LATAM focused customer service product that on the one hand, suits their current market but has some challenges for North American markets. The biggest challenge is the obvious one. As of now, they have only a Spanish version, though they recently acquired their first U.S. customer, putting them on the spot to complete the English version in the near future. Their roadmap is prudent yet ambitious, not only incorporating some re-architecture of their product around Websphere, depending on an opportunity to partner with IBM. More definitive is their future inclusion of other channels and capabilities into their product suite, particularly SMS, Online Chat, fax-to-email and native Mobile to go with both the social and traditional channels they already incorporate. What seems to be a little skewed or at least unclear, is their business model or what they present as their business model. Consulting is not the course of action we recommend for them but rather a solutions-focused model that uses professional services to implement them. If that is the way they go to market, then they need to align their messaging much more appropriately to their business model. Additionally, it would be valuable for this small company to pursue some partnership for additional exposure to the U.S. market once they complete their English edition. What is clear is that they have a very good product that is what it claims. It’s easy to use, yet customizable to a degree that is laudable. What is also truly smart is their treatment of social channels as no more than another set of channels for agents or managers to use in their quest to provide customer service effectively. Their roadmap for the future with the incorporation of text, online chat etc. shows that in spades.